Ziplines are one of the most awesome experiences you can possibly enjoy in life. It combines adrenaline and fun all in one and you can pretty much find one in every country you go to. We decided to highlight the 10 Most Incredible Zipline Experiences. These ziplining experiences are some of the most popular ones from around the world. We would also like to add the fact that there are a couple of experiences that are from the same country. From that, you can pretty much gauge where the hot spot for ziplining is for your future reference and adventure. This is quite the fun activity and is something the entire family can do. It’s time to get away from the boring nature of your vacations and add a little adventure. Check out our list of the 10 Most Incredible Zipline Experiences below and let us know if you’ve had an awesome experience as well. This is the first of many ziplining experiences from Costa Rica that will be featured on our list. It is one of the highly rated experiences. You are definitely going to be taken back by the amazing visuals all around you. Who doesn’t want to zipline in Alaska? It’s a completely different experience from the Caribbean and South America. Here you can enjoy the views of Alaska from new heights. We revisit Costa Rica for another zipline experience. The luscious canopies in Costa Rica are just ideal for ziplining. Moving to the Caribbean, we now venture to San Juan, Puerto Rico. The views from this zipline experience is unrivaled. Here’s another American zipline experience that is supersized. There is no getting bored when you venture to the Mega Zips at Mega Cavern in Kentucky. Costa Rica we meet again and this time we’re bringing you to an adventure park. Yet another reason Costa Rica is zipline heaven. This is a totally different type of zipline experience. Instead of going over canopies or through picturesque locations, you can boost that adrenaline by combining a zipline experience with a roller coaster experience. Here’s a little extreme ziplining for you. You can zipline through the mysterious Jaguar Cave in Belize. Don’t worry it’s completely safe, the jaguars won’t get you. The beautiful skylines of Haleakala, Hawaii can also be enjoyed from a zipline. There is honestly no better way to enjoy the beauty of Hawaii. There’s nothing like liming around as they say in the Caribbean. 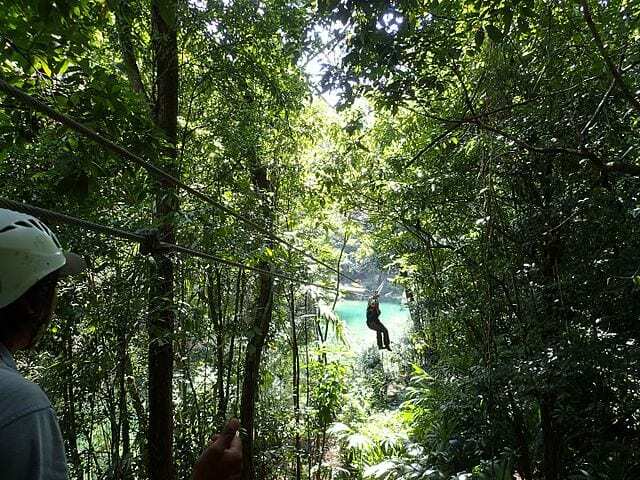 Instead on liming on the ground, this adventure offers the opportunity to do so while ziplining over lush greenery.